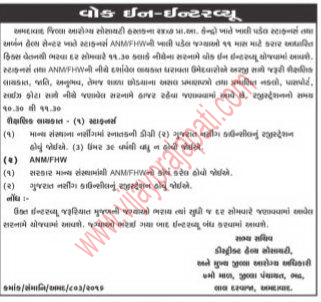 District Health Society Ahmedabad has published Advertisement for below mentioned Posts 2016. Other details like age limit, educational qualification, selection process, application fee and how to apply are given below. Graduation degree in nursing from recognized university, Having Registration in Gujarat Nursing Council. Age Limit : 39 years. ANM/FHW Course from Govt. recognized institute. Having Registration in Gujarat Nursing Council. Venue : District Health Society, 07th floor, District Panchayat, Bhadra, Lal darwaja, Ahmedabad. Walk-in-Interview : Every Monday till vacancies not fulfilled. Registration Time : 10:30 a.m. to 11:30 a.m.